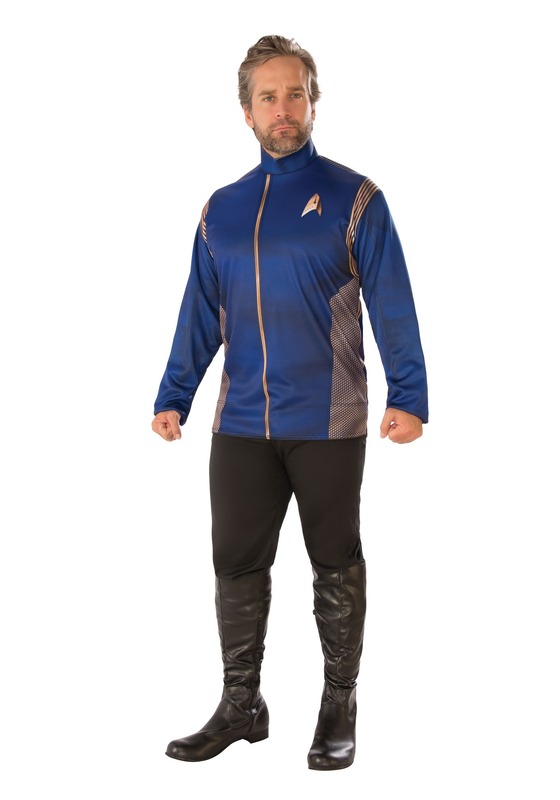 Get ready to join the crew of the USS Discovery when you suit up in this Star Trek Discovery Command Uniform Adult Costume! You might not know much about spore drives or Klingon battle strategies, or heck, you might have not even graduated from Starfleet Academy. But that doesn't mean your not fit for command! Nope, all you gotta do is slip into this Discovery Costume, and you can take command of the ship. Designed as a shirt that can be worn with any pair of black pants, this costume is CBS officially licensed straight from the streaming series. The polyester shirt secures with hook and loop fasteners in the back, and it's got printed details and a foam collar. It's a recreation of the Starfleet Command division uniforms from the show featuring gold accents along with the Operations Starfleet Insignia printed on the chest. Suit up with some of our phaser props and Star Trek accessories, and you'll be ready for action!